Collagen Extra ® Marine contains the most extensively researched Collagen peptides available in the market. Collagen Extra® marine is a unique formula combining Extra strength marine Collagen protein and Hyaluronic acid with Vitamins C, B complex and Magnesium. B5, B6 and Magnesium. In liquid form for better absorption and bioavailability. Collagen Extra® marine contains almost two times the amount of marine Collagen and four times the amount of Hyaluronic Acid compared to other products in the market. Most studies show that collagen is beneficial to humans when taking 7,000-10,000 mg daily. Collagen Extra® marine contains up to 20 times more collagen than any capsule or tablet in the market. Studies show that liquids can have up to 50% better and faster abortion when compared to tablets or capsules. Liquids can be absorbed up to 98% in the blood steam. Collagen Extra® marine contains Vitamins B complex, magnesium and Vitamin C which help the formation of elastin and natural collagen. Collagen Extra® marine is a scientifically researched formula produced by one of the leading German manufacturers with over 40 years’ of experience in research, development and production of liquid-form nutritional supplements. Fine lines and wrinkles are a key indicator of age and as such, wrinkle prevention is the primary aim of many consumers. A 12-week study conducted by Dermscan in France demonstrated that consumption of the Peptan ® collagen peptides contributes to a significant decrease in the number of microrelief furrows by 26%. The trial also showed that Peptan ® F collagen peptides can help prevent deep wrinkle formation and increase skin suppleness by 19%. Similarly in Japan, 33 women aged between 40 and 59 took part in an 8-week clinical study. Cutaneous hydration measurements were performed in this trial with a Corneometer® CM 825 to record the collagen peptides moisturising effect. At the end of the trial, the Corneometer measurement found an increase in skin hydration of 28% for participants who had ingested collagen peptides. No increase was observed in the placebo group. The administration of Peptan® collagen peptides led to a direct increase in skin hydration in almost two thirds of the participants, demonstrating that a daily oral intake of Peptan® F collagen peptides can significantly improve skin dryness and its associated signs. In the latest study done by Cosderma in France, 106 women took part in a clinical trial to assess the effectiveness of Peptan® F collagen peptides. At the end of the 12-week study, a collagen fragmentation decrease of 31% was reported in participants who received Peptan® F with obvious results after just one month. No change was observed in the placebo group. By decreasing collagen fragmentation and increasing collagen density, Peptan® F lead to visible improvements in skin structure, firmness and elasticity after 1-3 months, boosting the collagen network and thus promoting visible anti-ageing effects on the skin. This restructuring of the skin is key to the understanding of how Peptan® F can boost the collagen network and promote younger looking skin. The Collagen peptides used in Collagen Extra® marine is an award winning example of an effective collagen peptide ingredient. Offering a unique combination of amino acids not found in other protein sources, Collagen Extra® Marine is derived from natural origins of fish grade collagen halal /kosher peptides. The main structural element of the skin, collagen is largely responsible for its characteristic properties, such as firmness and tonicity. 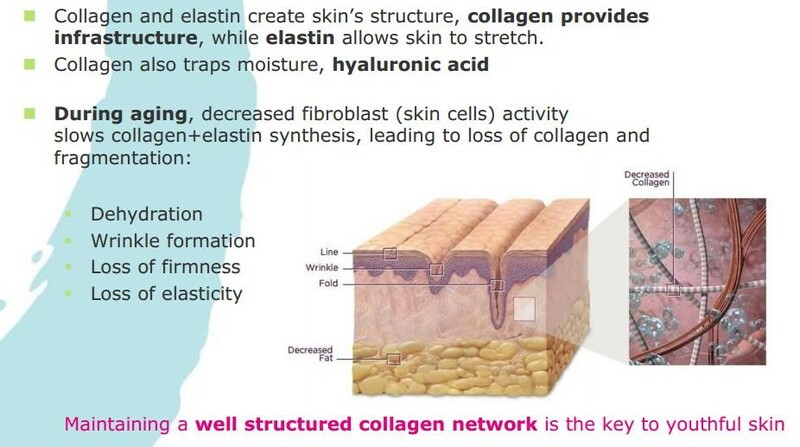 The most abundant protein in the body, collagen’s role is to maintain the structure and resistance of the skin’s tissues, creating a network which anchors the layers of the skin and forms a support base for components such as elastin, to maintain skin elasticity and hyaluronic acid to lock in moisture. Collagen fibres, constructed within fibroblast cells, are responsible for the maintenance and resistance of the skin tissues. The presence of collagen peptides regulates the activity of fibroblasts in the skin and stimulates the production of both collagen, and hyaluronic acid which is important for skin hydration. As we age, the production of new collagen fibres declines as the collagen synthesis by fibroblasts decreases. Collagen is also hindered by its own aging process. 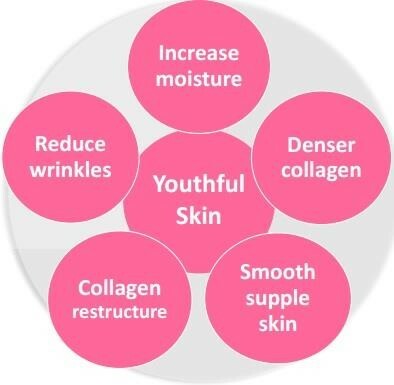 With age, collagen becomes more and more cross-linked and fragmented. That makes the skin tougher and limits the protein’s ability to bind large qualities of water, making the skin appear dry, dehydrated and old. Smooth, firm and younger-looking skin requires optimum levels of well-organised collagen fibres to ensure that it retains its elasticity, firmness as well as its moisture-binding capacity. Research has shown that exogenous collagen peptides may act to trigger the synthesis of new collagen fibres by stimulating fibroblast cells. 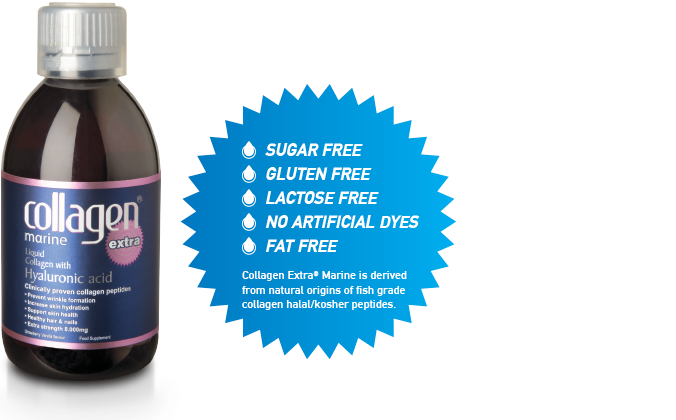 Collagen Extra® marine. Liquid food supplement with Collagen, Hyaluronic Acid, Vitamins and Minerals. 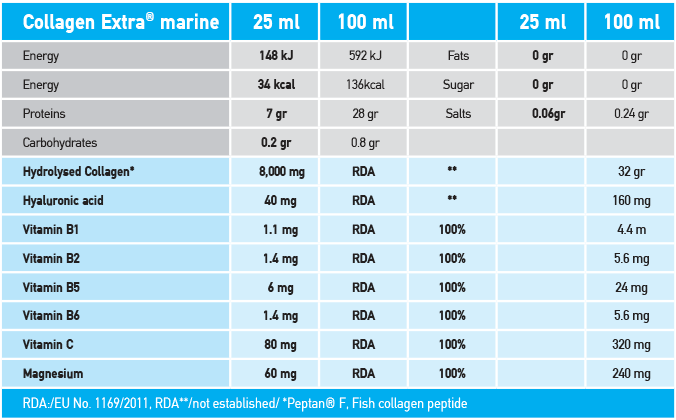 Collagen Extra® Marine is derived from natural origins of fish grade collagen halal /kosher peptides. Collagen Extra® Marine is manufactured in Germany for Medicare Europe Ltd. The production process follows the guidelines of ISO: 9001:2008 and Good Manufacturing Practice, GMP regulated by the German drugs agency.